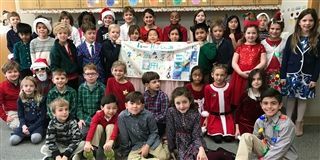 As part of the 2nd Grade's study of continents, the students made a flag and sent it off to Antarctica. The scientists there have received it, and it was flown above the Cape Royds Adelie penguin colony in January! The scientists will send it back to us in a few weeks. They use the flags to measure wind speed and direction over the Adelie penguin colony. Just a quick note to say your flag and cards made it to Cape Royds. And once again Tower Hill's flag will grace our black-and-white environment and give us some color to look at. Thank you for your continued involvement in our project. Love the picture of your class as well. What a bunch of cuties. Here is the link to the flag on our website.